TRAP DESCRIPTION: 5" Wide x 5" Tall x 16" Long. This Green Live trap is ideal for problems where you want to hide the trap in the landscape. It will catch small animals like chipmunks or rats. It's green color makes it easy to hide in the yard when trapping outside. It has a 1/2" by 1" mesh so it can hold most any small animal including flying squirrels or rats. 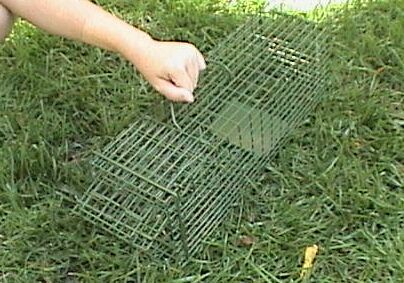 WHERE TO USE IT: The green color of this trap makes it ideal for use outside where you wish to hide or keep the trap discreet and not easy to see. Use it where the most activity is found which could be in the yard, a tree, around a bird feeder or in the grass. PRODUCT NOTES: Keep in mind this is our "economy model" trap and in many cases you will have to tweak the mechanism to get it to function smoothly. We check them before shipping but during transit or after catching an animal or two, minor adjustments may be required. If you want a trap built to last with little or any fixes needed during normal use, get the LT5518. 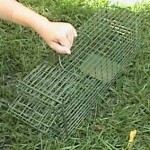 Its worth the extra cost – especially if you plan on catching 5 or more animals or want a trap to last 10 or more years.